Bridesmaids. A bride’s personalized gift for the ladies in her wedding party. Goodbyes. Keep your friends close as you each head off to new adventures with charm necklaces with the names of your high school besties. Sports Moms. Baseball, softball, lacrosse, soccer, tennis, golf, and basketball seasons are in full swing. Be your kid’s biggest cheerleader by sporting his or her name, team, sport, and number. Pets. If you don’t have kids, your pets are your kids. And if you do have kids, sometimes you like your pets more than your kids. So commemorate your dog, your cat, your horse, or your fish with something charming. Your Favorite Swear Words. On a necklace. Yeah, we said it. We’ll stamp it. Vacations. Where is your favorite spot in the world? A beach? The mountains? Desert vistas? Big cities, small towns, lakeside cabins, or islands, we’ll keep you close to your happy place. Dancers and Cheerleaders. Dance is life. Cheer is life. Shout it out! Sources of Strength. Bible verses, meaningful words, symbols, and adages. New Beginnings. New schools, new jobs, new friends. 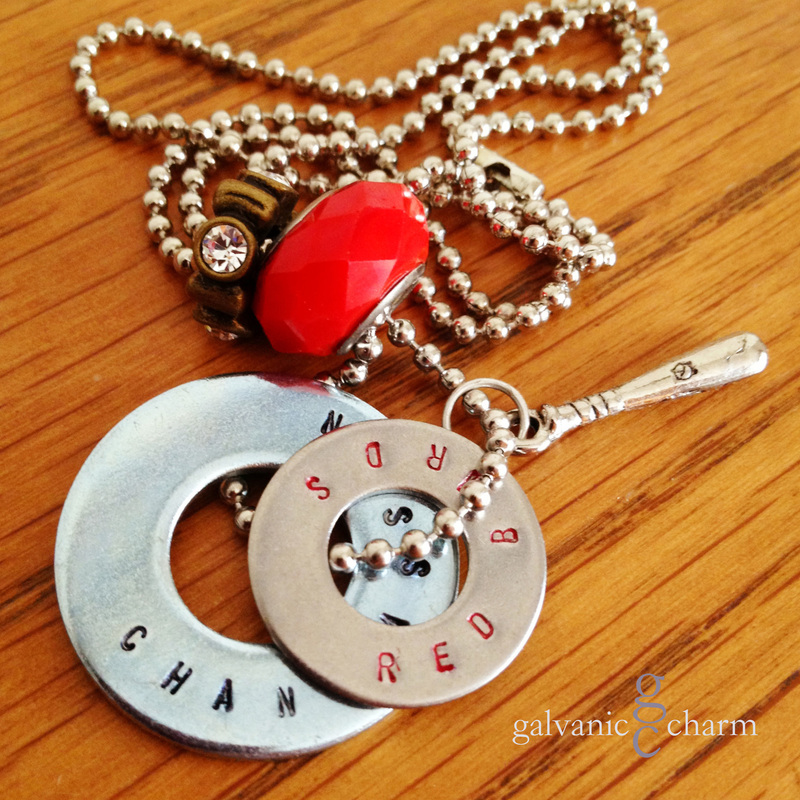 RED BIRDS – Booster necklace with 2 hand-stamped washers with team name and mascot. Stainless steel baseball bat charm, red glass and brass and white rhinestone charms. 24″ stainless steel ball chain. $40 as shown.